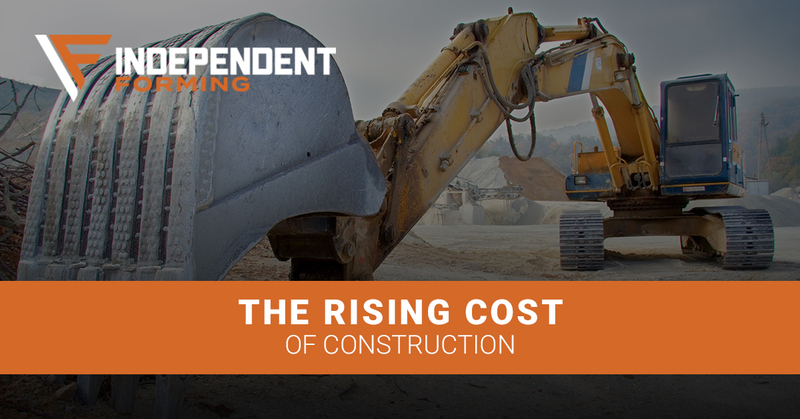 According to the Associated General Contractors of America of new Labor Department data, construction costs rose almost nine percent between May of 2017 and May of 2018. The implications for builders is alarming, and that is before any costs associated with potential tariffs currently in place or possibly arising in the future are considered. As the trend appears to be set to continue, builders are looking for ways to safely cut costs and save money. Purchasing or renting used concrete forms is a great place to start, and here at Independent Forming, we are ideally positioned to help you find the exact styles, brands, and sizes of used concrete forms that you need, at a price that will help you feel a little better about what your spending elsewhere. Let our team know what kind of materials and in what volume you’re looking for and get a free estimate today. The numbers above come from an article on ConcreteConstruction.net, an online authority in the concrete pouring and building space. They noted that the annual increase in cost to a builder is outpacing the price index increase that builders are charging. In short, builders are struggling to maintain their profit margins and continue to grow the business they do. This spike in the cost of construction materials, like concrete, isn’t something that comes as a huge surprise to anyone who has worked in construction for any length of time. Prices of raw materials have been steadily increasing more or less for the last century. The real shock is the rate of increase that we saw over the last year. Factors ranging from resource scarcity to foreign policy all play roles in how the trend speeds up or slows down, but the reality is rising concrete prices are here to stay. Looking to alternative sourcing, like used concrete forms for your concrete wall and foundation pouring needs is one great way to mitigate the impact of these price increases on your business. No one can say for certain how dynamic construction material prices will fluctuate moving forward, but there is one consensus among experts — costs will continue to trend upwards. Oldcastle Building Solutions projects as much as another three to four percent increase in the cost of Portland Cement, Ready-Mix Concrete, and Aggregate materials in 2018 alone. How will your company adjust to inflating price tags on the materials you rely on to provide your services to your customers? Reducing costs where you can is a good place to start, and one place that Independent Forming can help is with your concrete formwork systems. Whether you are looking for modular steel-ply concrete forms for sale or rent, or even looking to generate some revenue by selling or renting your older used concrete forms, contact us today and see how we can help your bottom line. So what is causing the steady rise in prices for these particular materials? Many experts are pointing to a dwindling supply and increasing demand for one special, often overlooked natural resource — sand. A quick look at the ten-year cost trend for a metric ton of sand makes it clear that something is going on. Sand is a crucial component in many building supplies, including concrete. As the world’s supply of sand being used at a faster rate month over month, prices, wait times, and project deadlines all increase, making a builder’s job harder than it already was. Unfortunately, the geologic process that creates sand is incredibly slow. Meanwhile, urban construction is racing to keep up with an influx of people and growth that require this precious commodity for housing, roads, and windows. Independent Forming is committed to being a solution driven partner for businesses in the construction space. We understand the depth and breadth of the challenges that your company face in delivering timely, cost-effective services to your clients while maintaining profitability for yourself. That’s why we search high and low, nationwide, to help you find the best fits for purchasing, renting, and selling concrete formwork supplies and materials. If you are looking for ways to defray costs and increase margins for your building projects, let Independent Forming provide a free estimate for you and take the first step toward addressing the rising costs of providing concrete construction services.